1. How would you rate the Old Fisher Store on its Collector's value? 2. 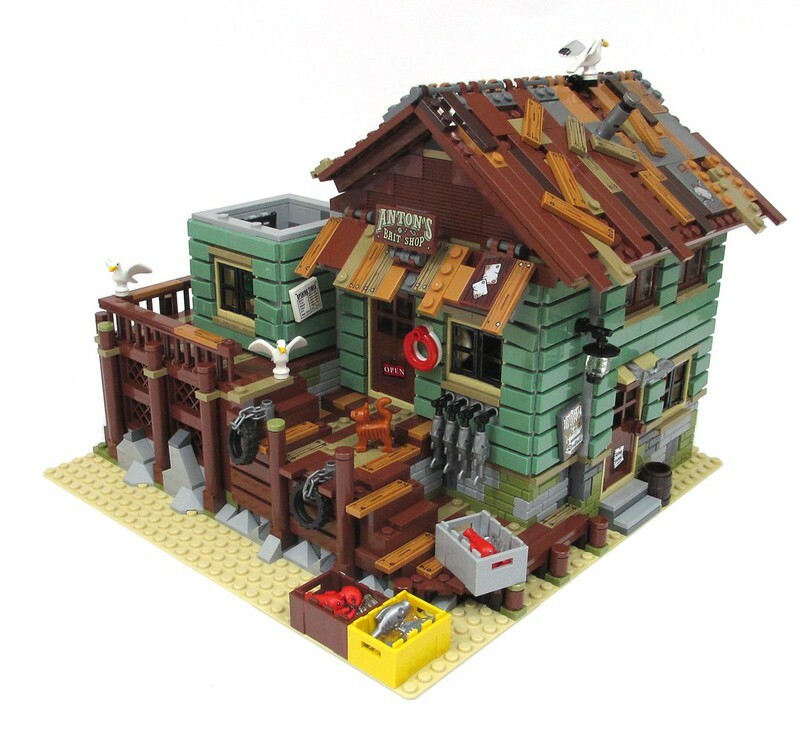 How would you rate the Old Fishing Store on its MOCer value? 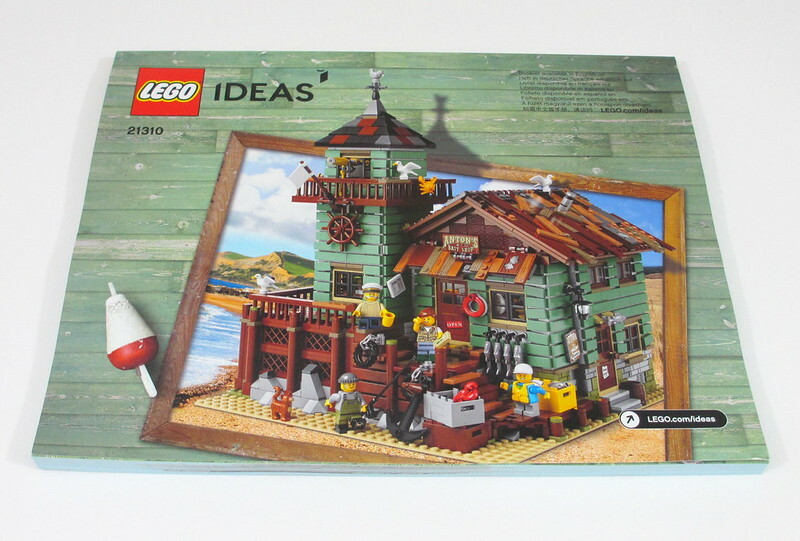 The Old Fishing Store is the 18th, the biggest and the most expensive Ideas project released to date. It weighs in at 2,049 pieces, 80 more pieces than the Saturn V and retails for $149.99, $30 more than the Saturn V. It is also one of the few Ideas sets based on a MOC that is not a based on some existing piece of intellectual property. In my opinion, what I would call “original” Ideas projects are rare because it seems to be more difficult to generate the 10,000 supporters needed to reach the review stage without attachment to a license. Regardless of how much value a license adds with the public at large, the original Ideas projects tend to be the ones that earn my coin. A trip to my LEGO lair would reveal I am both a “MOCer” and “collector”. While most of the LEGO room contains bins of parts and pieces and the majority of items on display are my own MOCs, there are a two categories of official models that survive my thirst for parts, Star Wars UCS vehicles and the “Modular” series from the Creator Expert line. I have collected all the Modular buildings (save for Market Street) so in order for this set to become more than a “build, destroy and sort” parts pack, it has to satisfy a pretty high mark. Given this background, I will evaluate the set from both a collector’s point of view with an eye on display and play value as well as from a MOCers point of view on the value and desirability of the parts and techniques included. I have heard one of the "rules" for Ideas sets is they do not include new part molds, but recolors of existing parts, special printings and recent molds from newer 2017 sets may still attract buyers with their eye on using this set as a parts pack. My box arrived from Billund from DHL with a little bit of shipping damage. 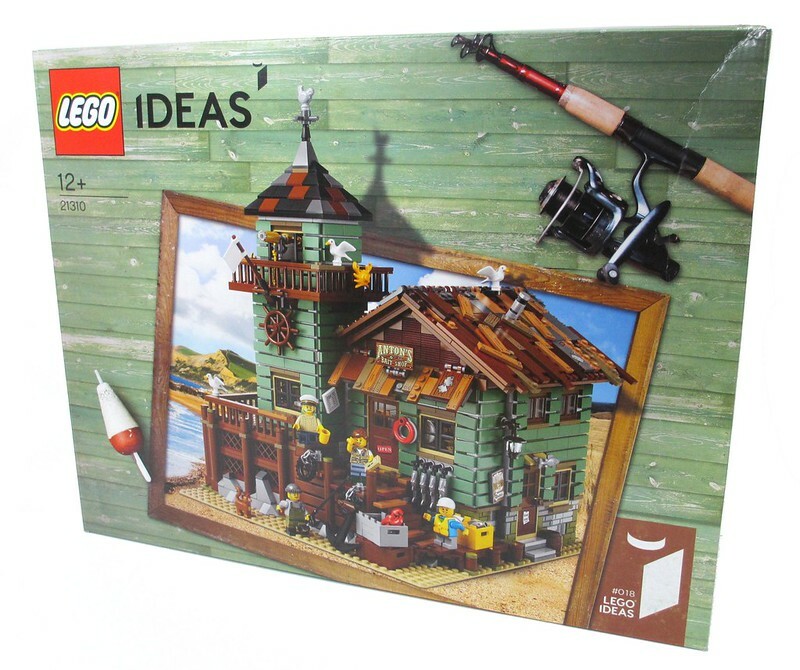 This box is very distinctive from any other LEGO box with the sand greenish wood grain appearance and the real word fishing gear sprinkled on the cover. I like the wood frame and the arrangement here which reminds me of something you might see in a scrapbook. What really stands out to me is the extra artistry put into the box. 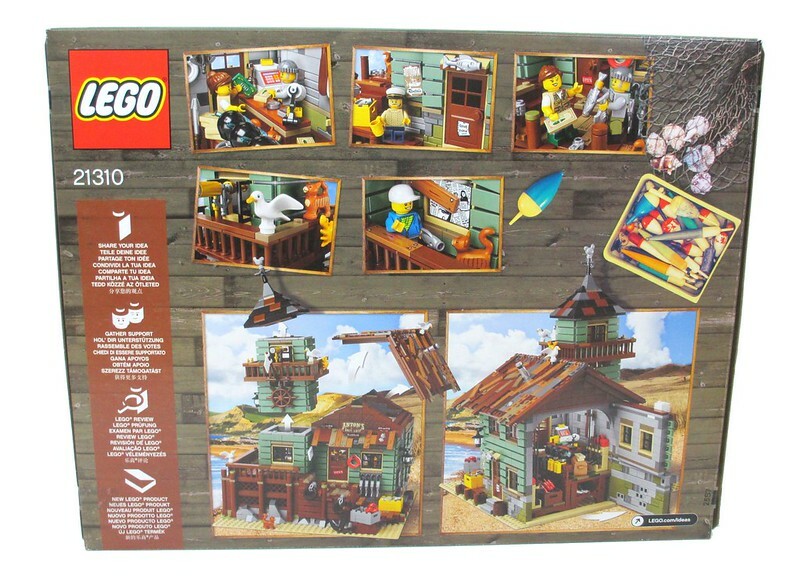 The back of the box shows some of the finer details of the set. The smaller call out boxes are cute, but I am not really sure they are the close up shots that really excite one about the set- instead they become more of an exercise in locating the orange cat making an appearance in each of the boxes. Opening the box reveals a number of bags broken into groups of bags numbered 1 through 7 and a separate bag containing the instruction manual and sticker sheet to keep it from curling up in the box. There are at least two bags for each of the seven stages identified by the numbers on the bag. The manual has a very similar look to the front of the box. The picture in fact is so similar I had to double check my photos to ensure I didn't accidentally stick a box shot in the instructions section. Most Ideas sets contain an information section in the front of the manual which includes interesting information about the intellectual property on which the Ideas set is based. 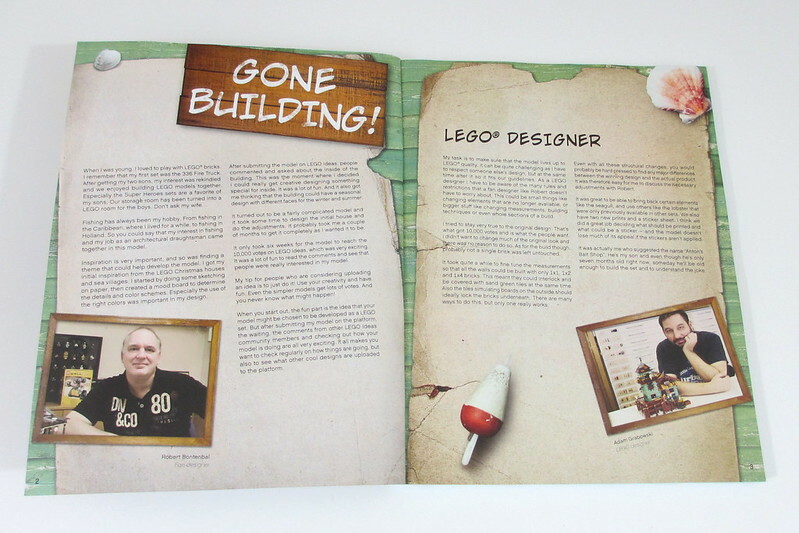 In this case, there is no property which is the basis for this set, so the Ideas information is limited to the first two pages of the book and instead includes comments from Ideas fan designer Robert Bontenbal on the left side while LEGO designer Adam Grabowski discusses his design process on the right side. Even a quick peek at the box reveals this set is likely packed with some niece pieces in a color pallet I really enjoy, so let's cast off, dive in and see what we reel in! One thing I would like to address right away is stickers. 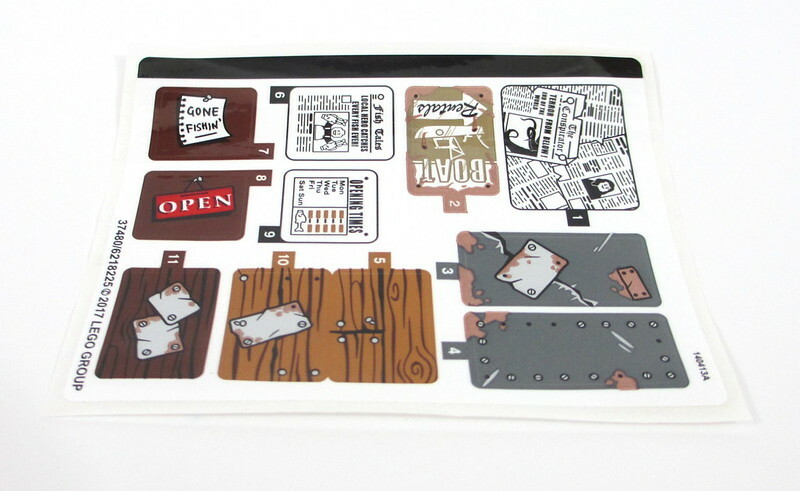 This set does contain a rather modest sticker sheet with only eleven stickers to apply. I am not a sticker “hater” and I generally prefer stickers to printed elements when contained in a “normal” system set that will end up in my parts bin. That being said, I do not mind printed elements (especially tiles) on display worthy sets, which is a good thing in this instance because this set contains loads of printed tiles. 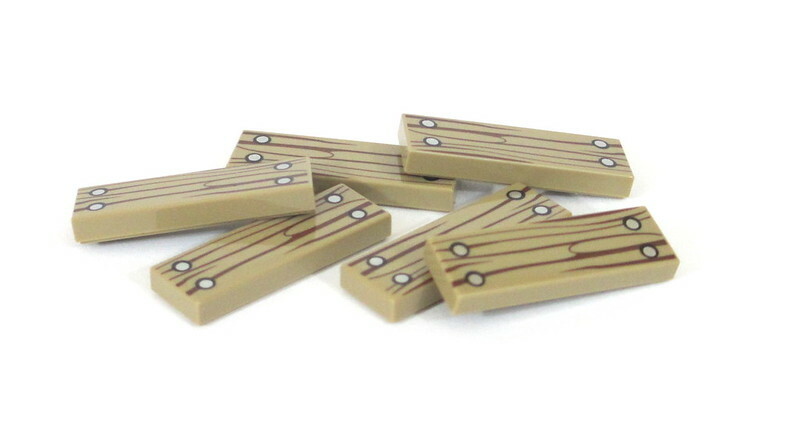 A part I am excited to have is a 1 x 3 printed tile in dark tan with a wood grain and four nails pattern. This set contains 17. 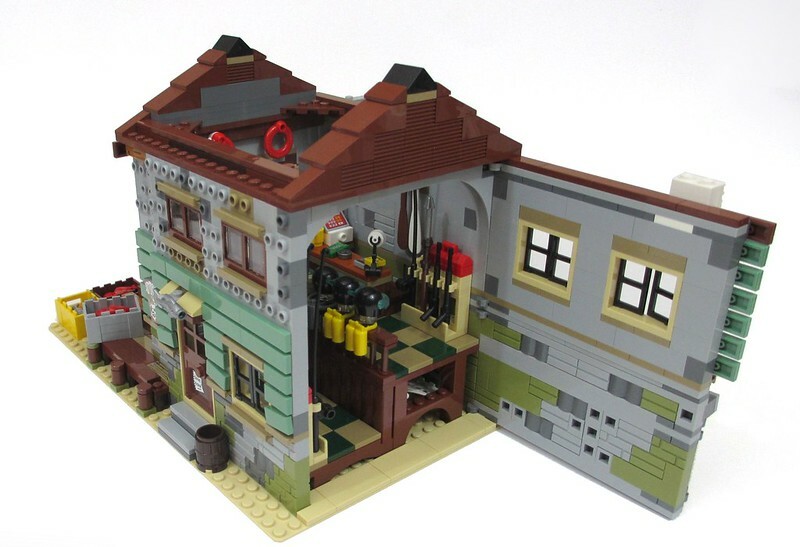 To date, Bricklink reports this part has only appeared in Killer Croc Tail-Gator, though I know it also comes in a Junior’s line Ninjago Movie set as well. It also contains another printed wood grain tile, a 1 x 4 medium dark flesh with a wood grain with three nails pattern. 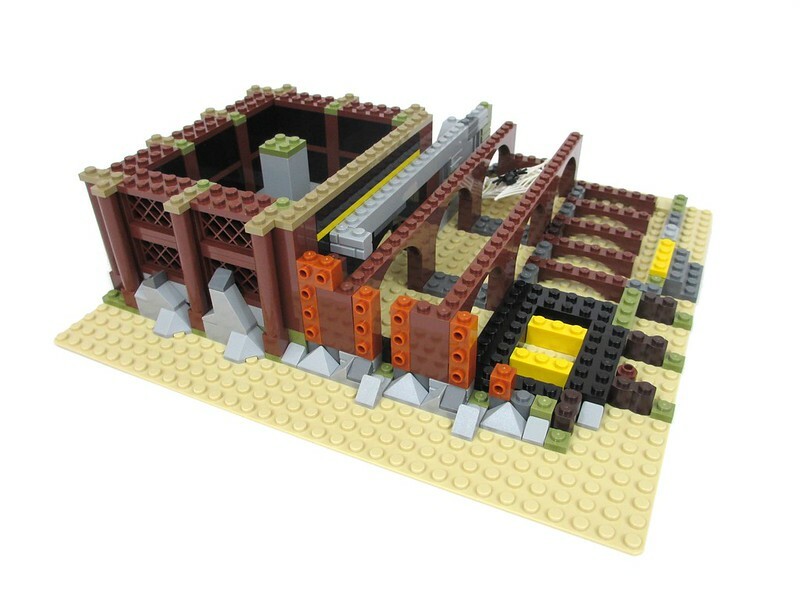 This part is fairly new with Bricklink only reporting 5 appearances in sets to date. This set contains a mind-numbing 30 of them, used throughout, but most noticeable on the haphazard roof. 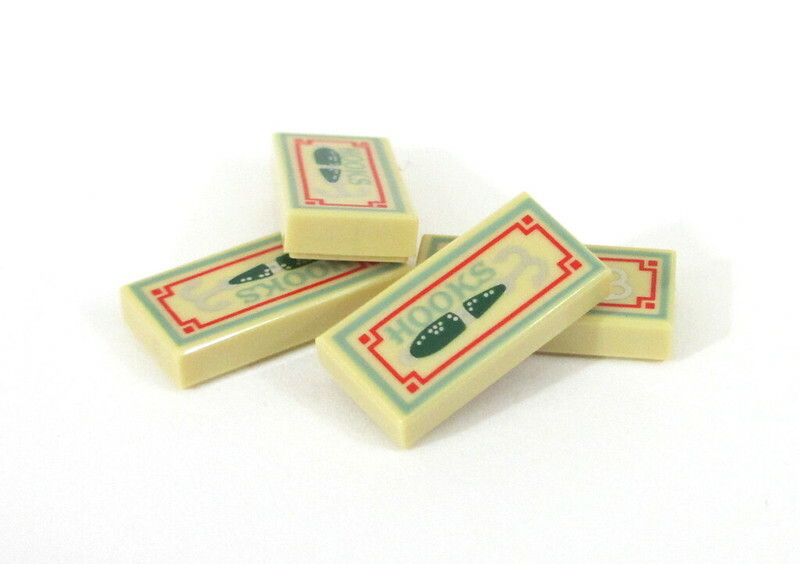 We also get two printed tiles exclusive to this set, the Anton’s Bait shop name tile and four fishing hook box tiles. While I like the tiles overall, the silver color of the hooks themselves on the tan background does make it a bit hard to pick out the details on the tile. I am not sure the Bait Shop tile will be overly useful in many MOCs, so I did not take a picture of it. The choice of name is noted in the instruction manual as a nod to the LEGO designer's son. Besides the printed tiles, this set contains a number of other parts that I am really pleased to see. There is the 1 x 2 x 3 window pane in black with thick corner tabs. This element has only appeared in the Batman Classic TV Series Batcave. You get 16 in this set. This set also recolors a new favorite of many, the profile brick (aka the brick, brick) into the luscious olive green. 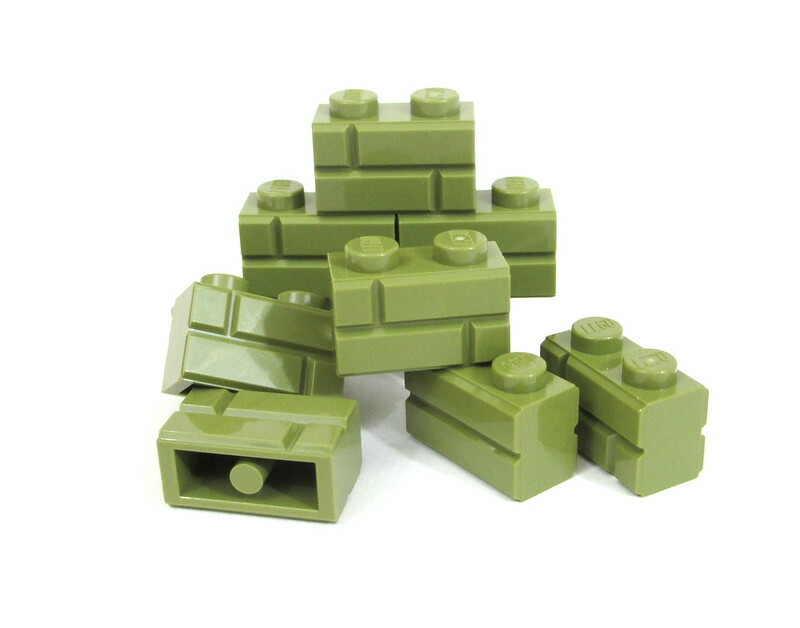 You get 22 of them here along with some other nice bricks and plates in olive green. 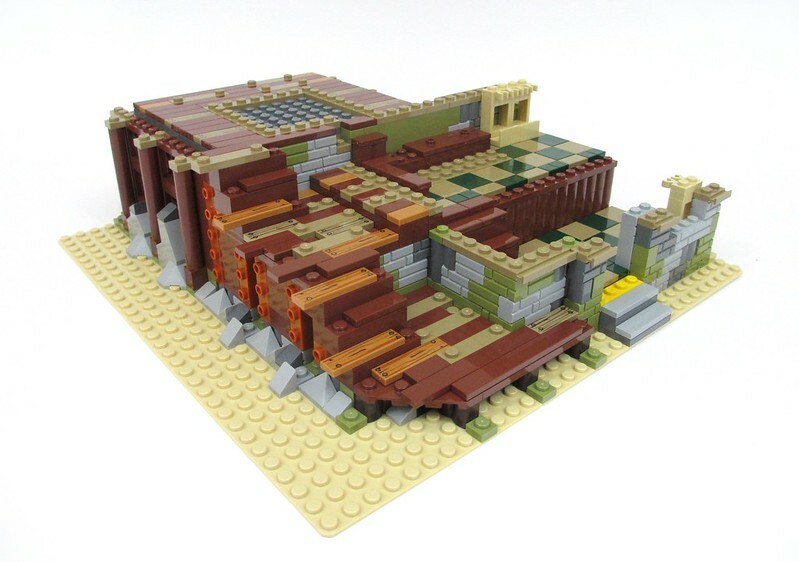 The set does contain additional "brick" bricks in dark and light bluish gray as well. 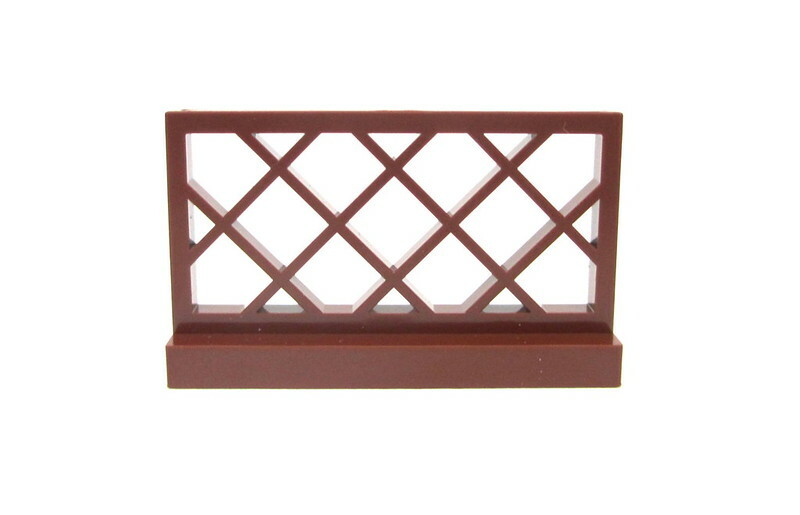 New to my collection is the 1 x 4 x 2 fence in reddish brown. This piece has only appeared in one other set, the Maresk Line Triple-E, though it did appear in large quantities in that set. The Old Fishing Store contains 14 of these fence pieces as the dock extends on three sides around the model. 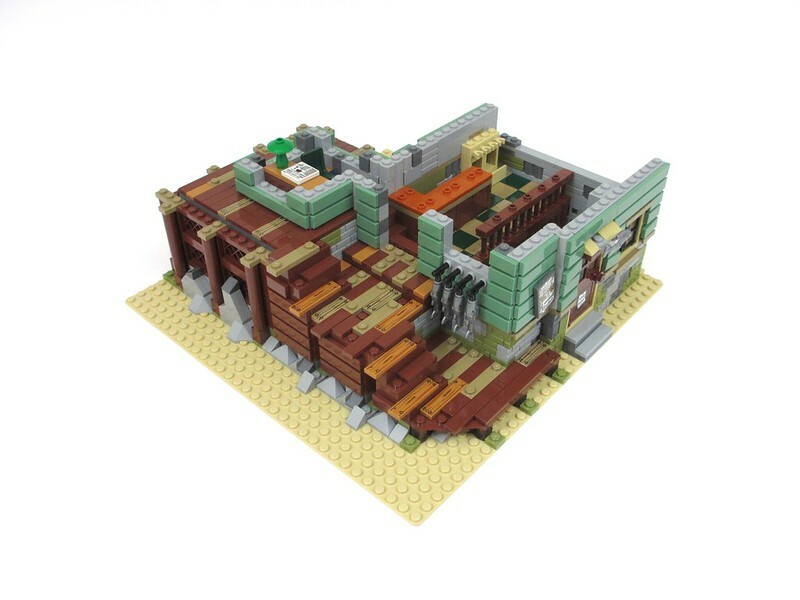 The 1 x 1 tiles in medium dark flesh also caught my eye and Bricklink says you can only find them in this set and Assemble Square. There are 14 in this set. They are hidden inside the model, used as tiling on the floor of the "tower" on the left side of the model. Of course, the one thing immediately evident from the box is the sand green tiles covering everything. There are a heap of them in this set with the 1 x 2 tile being used 107 times, the 1 x 3 tile logging in with 35 appearances and the 1 x 4 tile showing up 83 times. 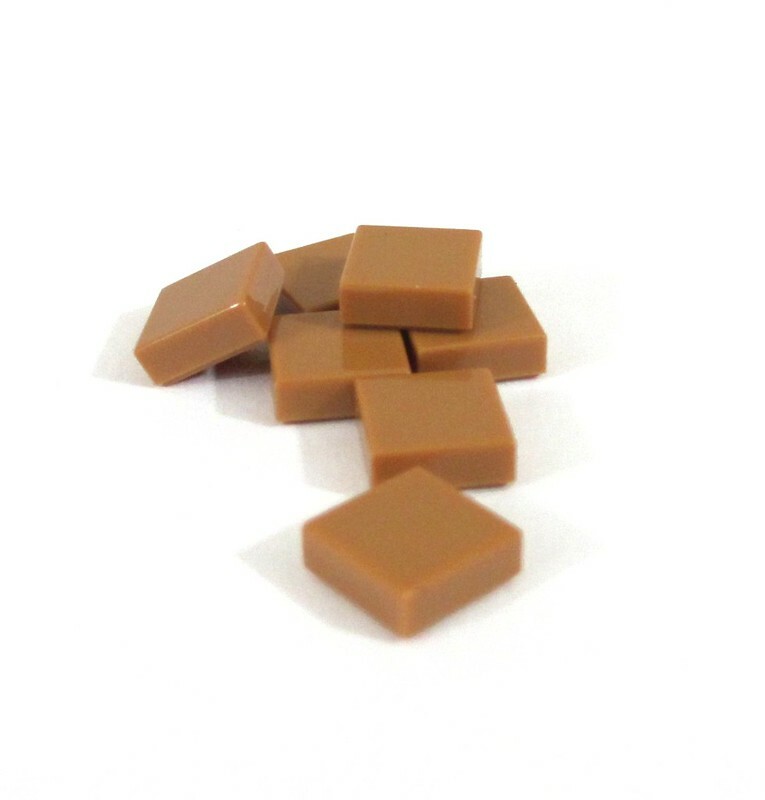 Along with the tiles, this set contains a large number of SNOT bricks in x 1, x 2 and x 4 stud lengths to attach these tiles. There are 56 dark bluish gray 1 x 1s, 94 light bluish gray 1 x 2s, and 75 light bluish gray 1 x 4s. 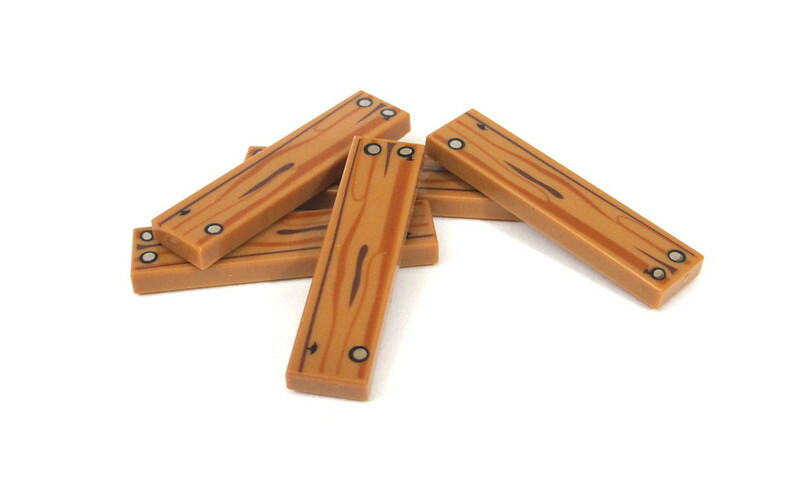 The 1 x 4s in particular really excite me as I always seem to be seeking out more of these on Bricklink. 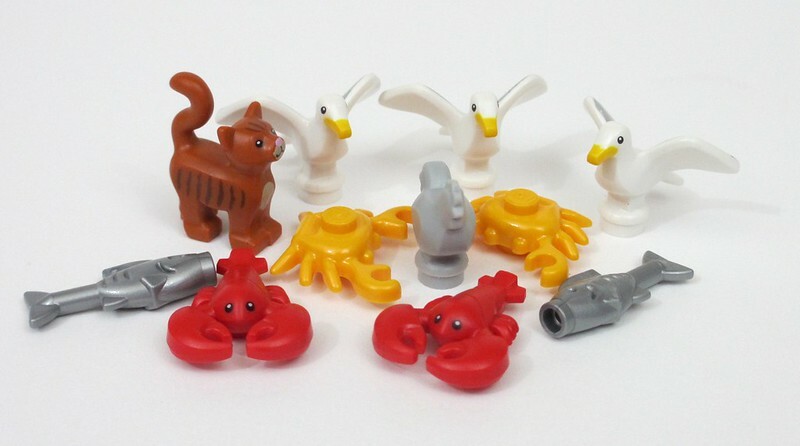 I would also make special mention of the less frequently seen animals appearing in this set, especially those which have previously only been found in the collectible minifigure line. You get three seagulls, two lobsters, two flame yellow crabs, a dark orange cat, eight fish in pearl silver and an unprinted light bluish gray chicken used as a weather vane. I would have liked to get the fish in a different color or in multiple colors. My hunch is the pearl silver color was appropriate for the fish used as signed above the doors and as such the pearl silver ones were picked above a rarer choice. The set also contains one black spider which is not pictured (nor exciting). Another aspect to wet your whistle is the minifigure accessories. There are loads of them in this set. Scuba gear, fishing rods, nets, scissors, harpoons, oars and life preserves are among the plethora of accessories adorning the store. A special additional call outs to the red “utensil toolbox”, which represent tackle boxes in this set. They have appeared in a limited number of sets (five in red and two in dark blue) to this point and you get two red ones here. A second call out to the crowbars, appearing in black here. 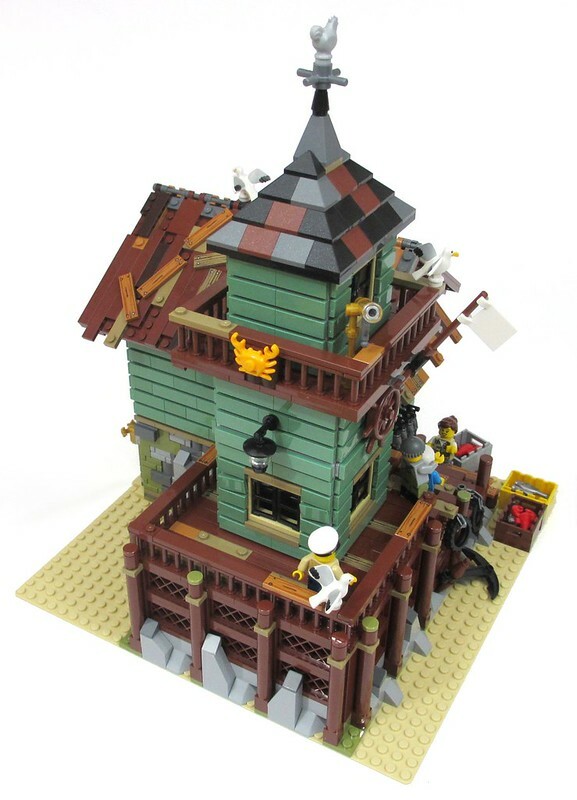 While Bricklink has no other noted appearances of the crowbar in black, this piece also appears in the new Ninjago City set. While I do not keep track of new prints for City dwellers, I am pleased with the look of the minifigures available in this set. I am especially fond of the fisherman/store clerk with the olive green overalls and dual molded legs designed to look like boots. 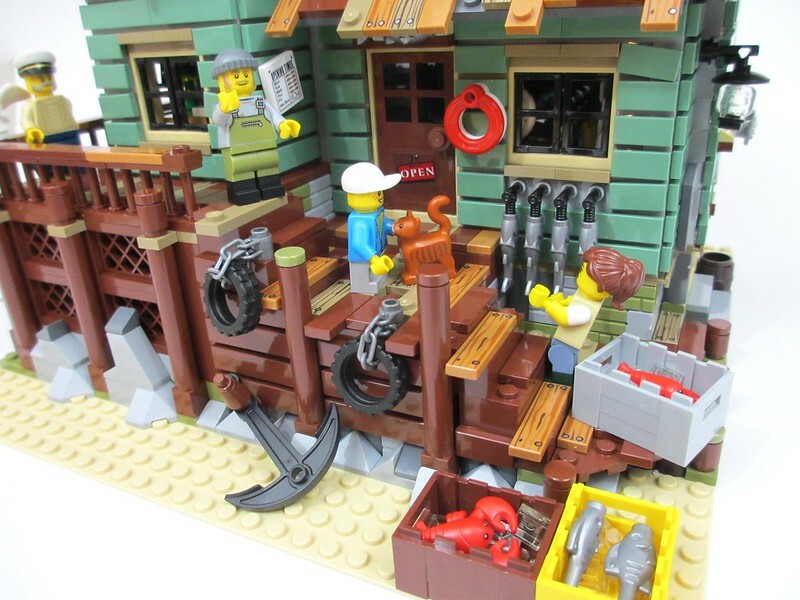 I would also make note of the captain's hat on the old fishing captain as well as the dual molded arms and legs on the fisherwoman along with the nicely printed fishing vest. All four figures also contain printing on the back of their torsos. The first set of bags builds the base for the shop and the complete base of the large docking section covering the left side of the model. 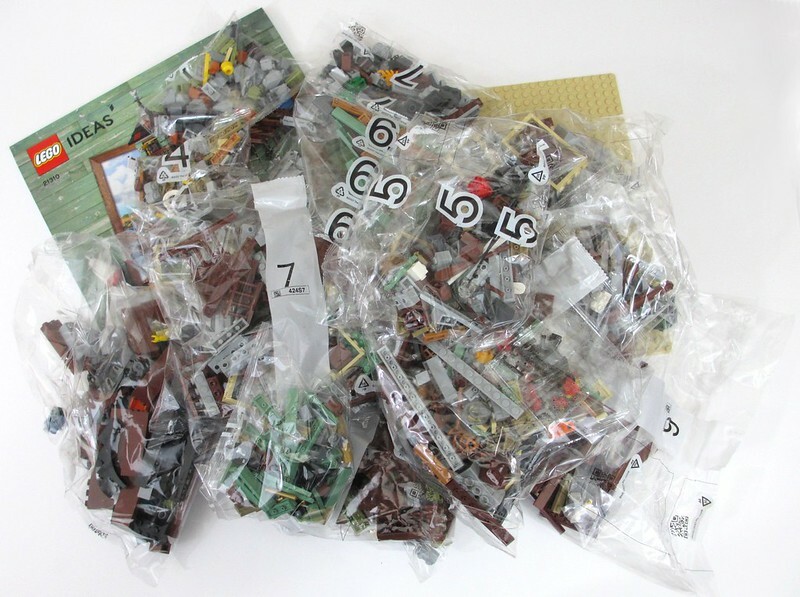 Like many sets of this nature, including the beloved modular buildings, the first set of bags require attention and stud counting to ensure you get every piece oriented the right way and the exact right spacing from the other pieces. I would also take note of the use of a baseplate which often only appear in the modular building lines in recent years. The plate is a regular tan color, which, while appropriate for sand, I would have liked to see in another color like medium dark flesh or dark tan since the tan plates are available at retail. The second set of bags builds the floor for the shop itself and the stairs and planks for the docking section. Parts of the store shelves begin to take shape in this section as well as the walls for the ground level section of the shop. The floor is tiled in a nice dark tan and dark green color pallet. While I like the color scheme, the checked pattern is beginning to wear on me as it has become almost boring. The third set of bags begins to build up the sand green siding and the hinged back wall of the shop. It also begins to build the “office” level of the tower on the left side of the shop. 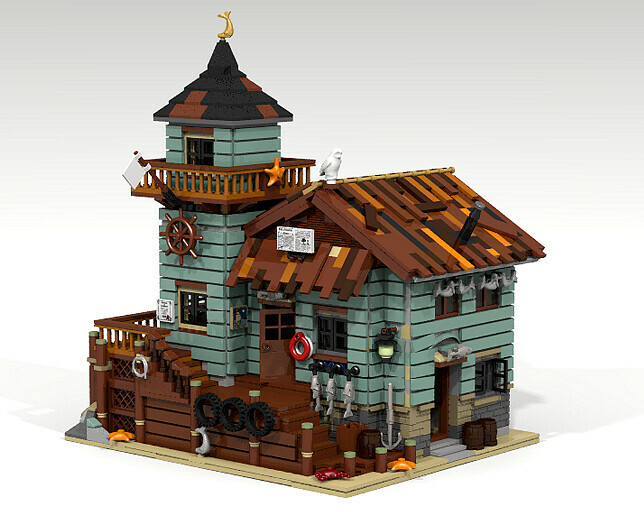 A few nice details begin to adorn the model such as the office furniture in the tower section and the fish hanging to dry under the front window of the shop. There are a few other details on the rear wall of the shop which we will view a little later on. The fourth set of bags complete the studs out construction of the lower portion of the shop. Be prepared to stack studs out bricks, rotate the model, stack studs out bricks, rotate model and repeat. The pattern becomes evident soon after the instructions begin. 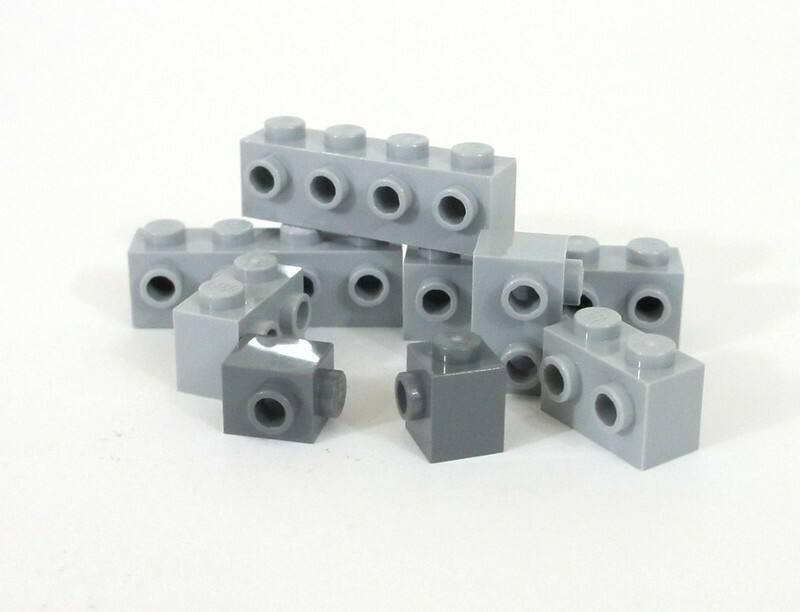 The one thing I would have loved to see through out is the new 1 x 1 with studs on two adjacent sides, especially if the piece could have debuted in light bluish gray. Unfortunately, that is not to be and instead the stacking does become a bit dull. The monotony is broken up by occasionally adding doors, windows, and a few more details in the interior. 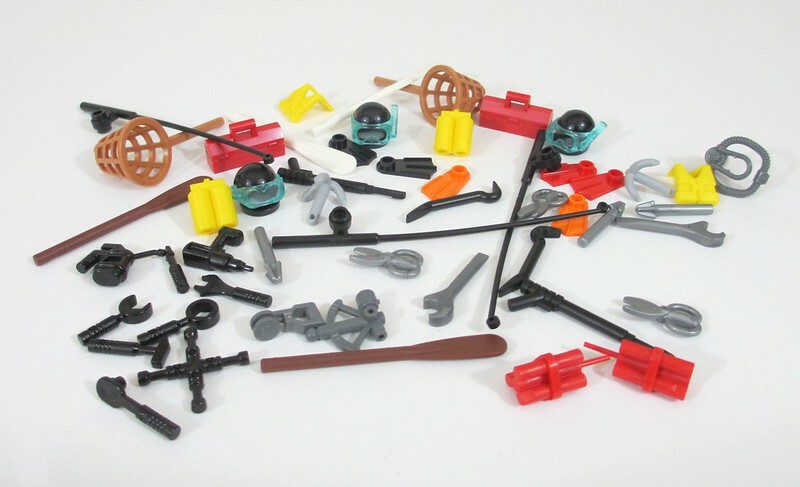 The fifth set of bags contains most of the minifigure accessories and fills in nearly every nook and cranny of the store with fishing gear. For the most part, I could fit my normal sized adult hands into the model to place the gear. This bag also contains the coveted lobsters. One nice little detail is the the boxes containing the fish and lobsters are also filled with some transclear pieces representing ice. The swing out rear walls and the removable (and in this case, non-built roof) made installing and viewing the details fairly easy. 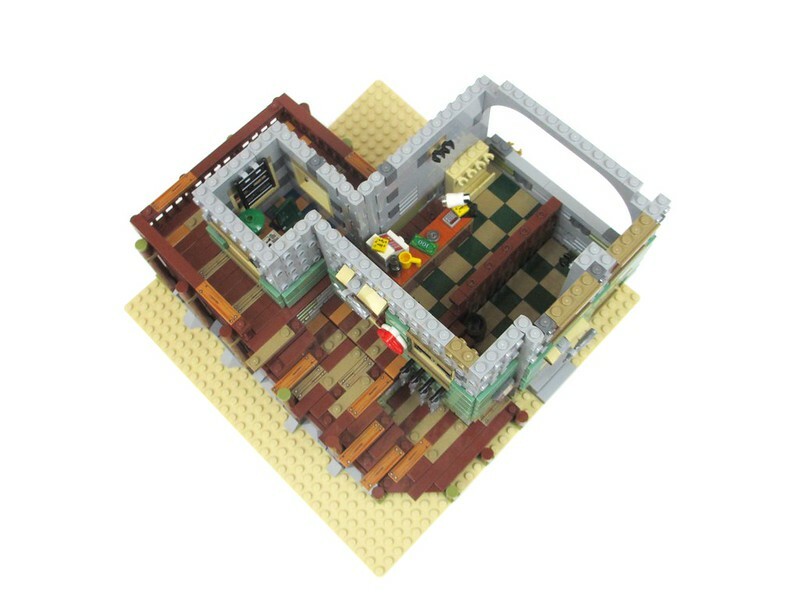 This stage also builds upper portion of the rear wall and the reddish brown gables for the roof on the main portion of the store. I would also note the hinged wall on the back is actually split horizontally into two sections which may be opened and closed individually. The sixth set of bags finishes the tiling the siding of the store and builds the dilapidated roof sections. This bag also contains the three seagulls which give the old store a little more character. Building the roof requires you to pay full attention to the stacked tiles and plates as the two halves are not symmetrical. The final product does look quite patchy, though I am still trying to figure out exactly what the vent on the top of the roof does, or how I feel about it tipped at such a steep angle. I hope you are again ready to slap on tiles, rotate model, slap on tiles, rotate model, repeat! While this stage can be repetitive, it also begins to help make the model feel complete. The seventh set of bags build the sand green tower and lookout platform which adorns the left side of the build. 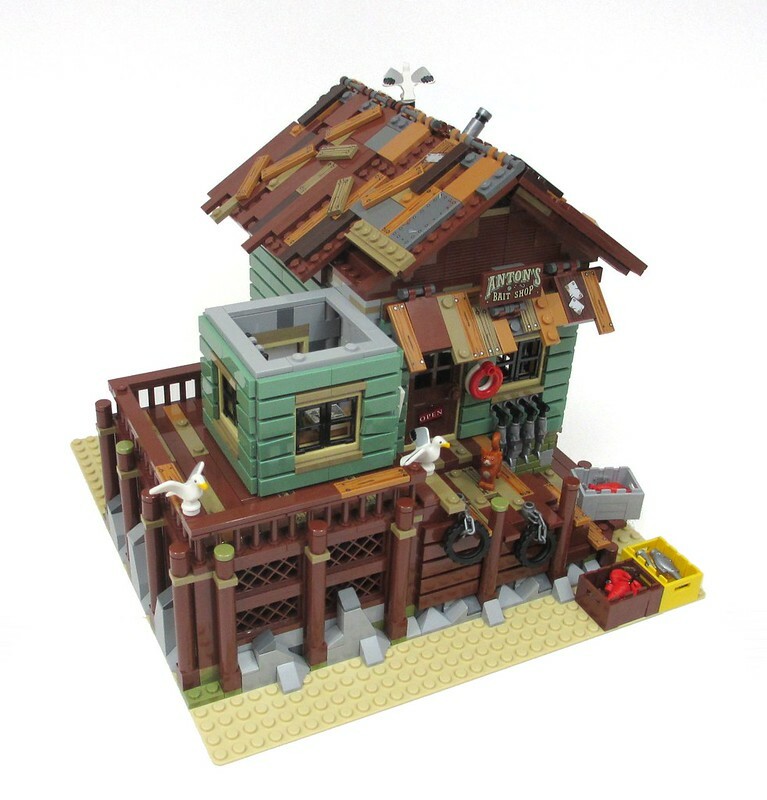 The original model contained a cute starfish detail on the railings, which have been replaced in the official LEGO set with flame yellow crabs. I personally prefer the starfish. The one thing I noticed in this section was the tiles are installed in such a way that they do not look like the overlap as you might expect them to, instead the same length tiles are applied on each level creating a straight seem right down the center. This is especially evident if you take a look at the top level of the tower on picture above. The model is completed by building the black roof with weather-vane on top of the tower. In all its glory, the finished model is gorgeous, though smaller than I had anticipated. Still, the detail and color pallet are so exquisite that someone unfamiliar with the hobby is bound to exclaim, “That’s LEGO?! ?” when they see it. Finally the detailing on the rear wall can be seen. The details include a couple of metered utility lines and a water spigot to clean off sand collected on the beach before heading into the store. One area that does lack some detail is the rear portion of the model behind the dock area. The little sand area here would have been a great place to stick a little worktable or bench with an overturned boat ready for some paint or repair from the shop owner. Perhaps the reason a detail like this did not make the final model is the fact that Robert also had a full-fledged boat repair shop also up for Ideas review the very next quarter. 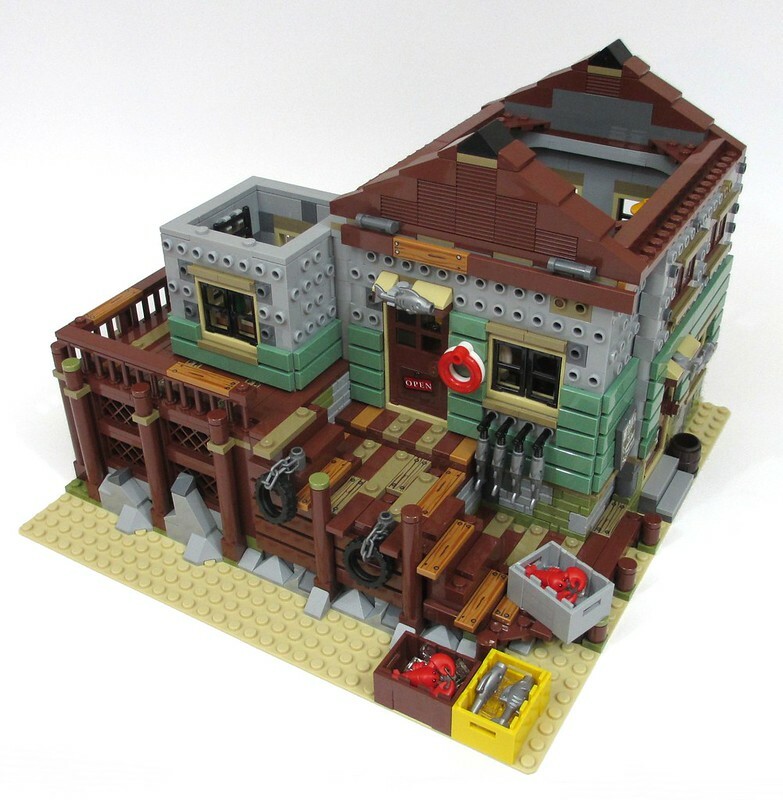 Sadly, but unsurprisingly given the selection of the Old Fishing Store, the model did not make it through review. Perhaps the least exciting view point of the model is from the angle above, though even at this angle, the model is still quite attractive. A detail shot of the front deck area. While there are some studs here and there which can be used to pose minifigures, I actually wished there had been a few more, especially on the stairs to help keep the figures secure while on display. Finally a detailed view of the shop with its fully loaded interior. The shop my seem a little cramped, but I really appreciated all the details loaded into the interior. As a final thought, I did find a few moments of the build experience more tedious than enjoyable, though the ultimate payoff is a gorgeous model that is a pleasure to explore with your eyes and imagination. I also did not discover any new techniques or part usages that blew my mind, something far more common in the Modular line. Still, the final model is beautiful and has really inspired me to consider building a companion piece to it from my own collection. There is no greater compliment than that! In terms of comparing this set to the original Ideas submission, I am quite pleased with the end result. The most obvious area of change from the submission to the final design is the shape of the “dock” area in front of the store. 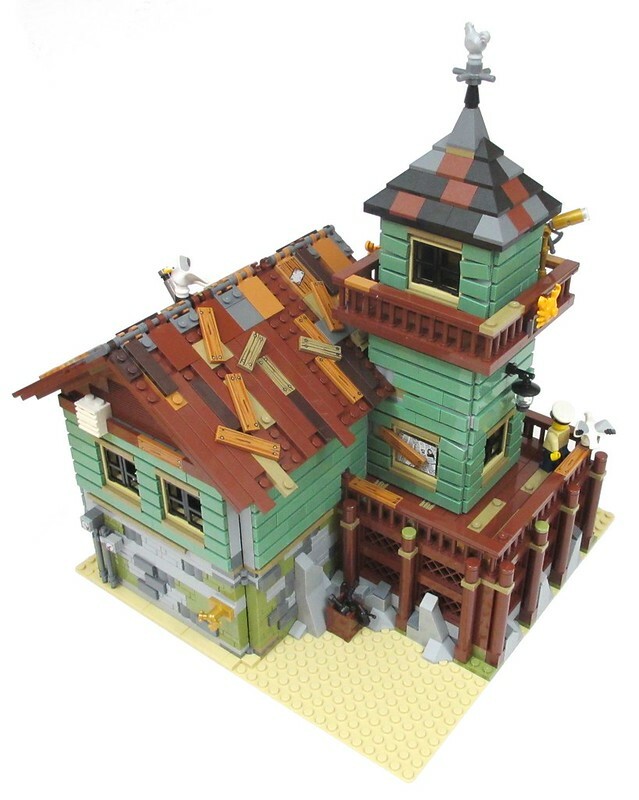 While I like the design of the dock area on the original submission more than the official model, the official model has its own areas of improvement, such as the detailing on the roofs and the coloration of other areas including the stone work around the base of the building. All-in-all I would classify the official set as an excellent representation of the original and I am quite satisfied with the changes made, though I still miss the starfish! This set has a lot going for it from a MOCers perspective. There are loads of reusable printed tiles, animals, minifigure accessories and some rare parts in decent quantities throughout. With a price to parts ratio of 7.3, the value is also solid. If you are craving some sand green, light bluish gray and brown parts, I would snap a copy of this set up without hesitation. As a display piece, the set is great. The overall size of the shop itself is smaller than I had anticipated, but it is loaded with nice details and a great color pallet. 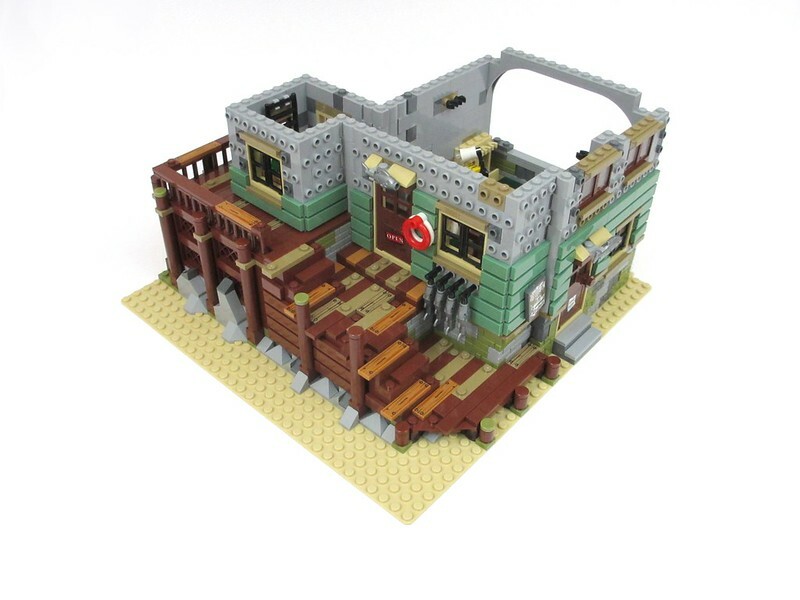 While I am extremely tempted to tear the set apart for all the great snot pieces and tiles, I ultimately believe this set is worthy to remain on the shelf alongside the modular buildings. I hope you enjoyed my review of the Old Fishing Store. Please feel free to comment on this review and don't forget to answer our poll questions! Great set. Thanks for the detailed review. Thanks for the awesome review! Great quality pictures! I love your writing style and compliments on the parts section. Very interesting. 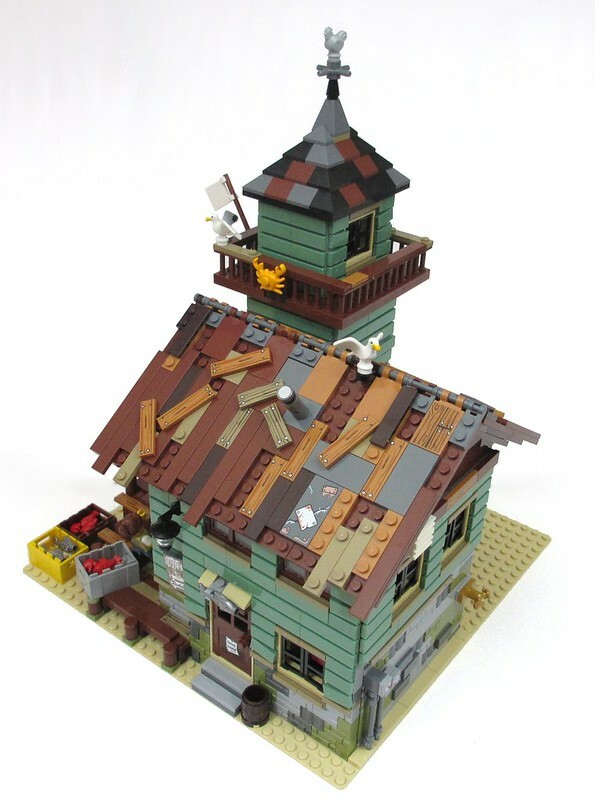 I just hope it sells well, so that Lego and the AFOL community votes on more of these types of buildings! All in all can't wait to add this to my collection. Thank you so much for doing up this awesome review. I love this set very much and I very much look forward to own this. Great review for a great set. Thank you. And I cannot wait to get one. Wow. This set is just stunning. And your review was amazing. I toroughly enjoyed this review, I like the attention to detail and your view on the new/recoloured/special parts that the set contains. I think I'll have to order 2 copies of this, one for the set itself and one for all the parts. Great review! I like the pictures you took during the build. Love the details in this set. Day one purchase! Great review! 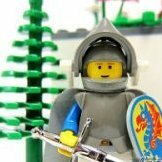 Excellent way to outline the project, the build, unique pieces, etc. Thanks for sharing for all of us! Excellent review that ticks all the boxes regarding quality of photos, writing and balanced reviewers perspective. Can hardly be done any better! Excellent review that ticks all the boxes regarding quality of photos, writing and balanced reviewers perspective. I'll echo this. It was a very enjoyable and informative review, with great pics. Thanks! I probably won't be picking it up, though, having shelled out a more-than-responsible amount for Elves sets. I was pretty surprised to see the tires hanging from the chains. It isn’t even a connection. Makes this feel more like a MOC than a Lego set. I like it. 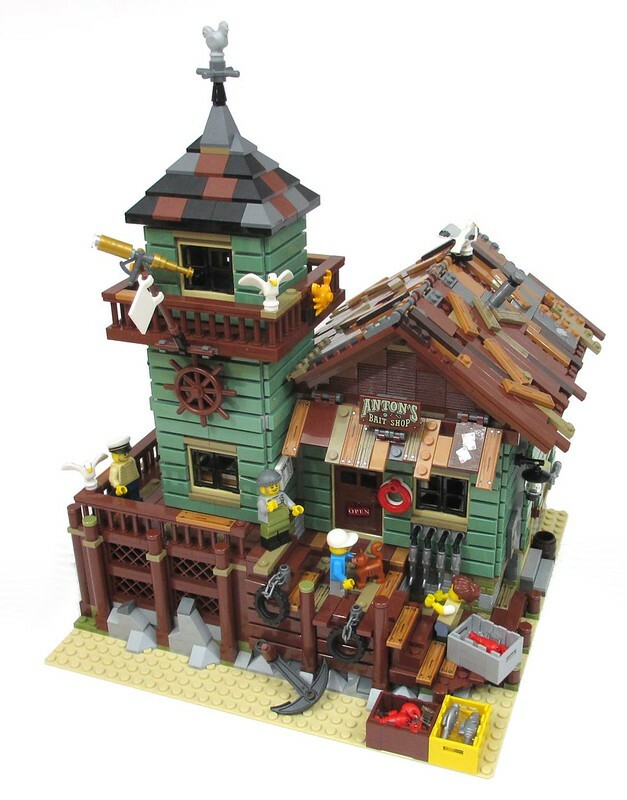 It is also one of the few Ideas sets based on a MOC that is not a based on some existing piece of intellectual property. In my opinion, what I would call “original” Ideas projects are rare because it seems to be more difficult to generate the 10,000 supporters needed to reach the review stage without attachment to a license. Regardless of how much value a license adds with the public at large, the original Ideas projects tend to be the ones that earn my coin. Glad I'm not the only one who feels that way. The science-oriented ones get a pass but the overwhelming majority are licensed/based off existing content. Seems rather contrary to the notion of user-generated ideas, so this completely original Idea is a very welcome addition. Thanks for showing some of the build and highlighting cool parts. Fantastic review! It is a beautiful set. We need more original content and less licensed/rehashed/member-berries. Thanks for the review. I'm thinking of getting this to put up beside my Haunted House for my annual Halloween display. By replacing the minifigs with scarier ones, I'm sure it would make a great fit as both sets use a lot of sandgreen. Great review and photos and a really nice looking set. There are parts I like of the set and parts I liked more on the original. The golden fish on the original in place of the rooster for instance. Overall it seems a really good concept -> production translation as that can often go way awry. I want this set and this review is fantastic! I think the issue is a double edged sword. On one hand the attachment to a license will help you garner the votes to make it to review- but on the other hand, the license can be a barrier when you actually reach review to create the set. The same is true after the review process when the LEGO set is in production. 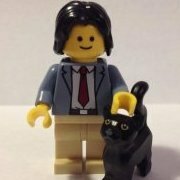 The license will bring in non-LEGO fans who like the property while there is some chance the license will alienate LEGO hobbyists who have no affinity for the subject matter. 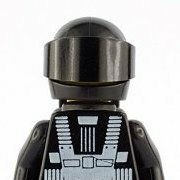 It does seem based on the submissions and what has been produced under Ideas that LEGO and Ideas supporters have more affinity for licensed material. That's fine, just not always my preference unless we get some nice parts at the right price point! Great set - great review! Great set. The one thing I know I am going to modify is the roof. it loks a little too "old" for my liking. That business wouldn't pass a workplace security inspection :). Love this set. I am eager to get this since it was announced. 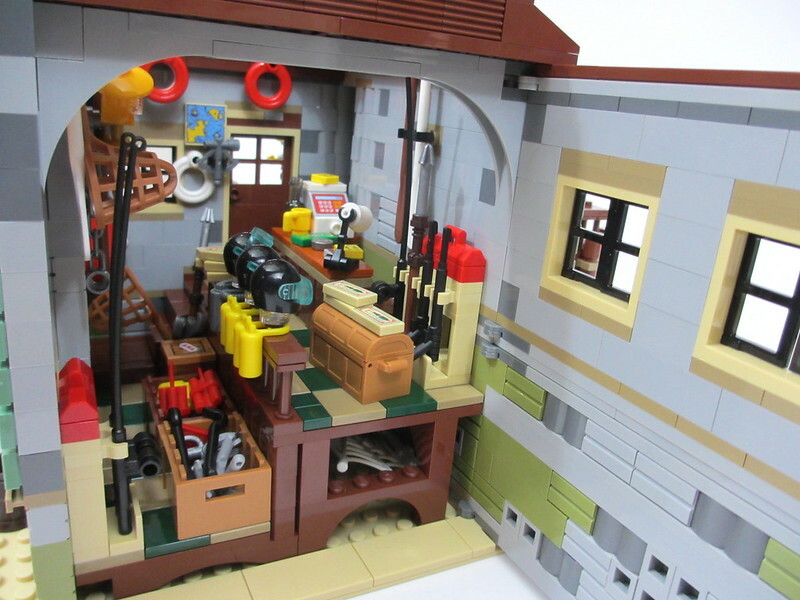 Perfect, cozy, and neat detailed set for my small layout :) Now I am not sure whether buy Ninjago city or this set first... Any advice? I know what you mean. But the small "fix" to place the out of place plates correct will do wonders I imagine. Good review, great set! Also looking out for the combination with the haunted house. House reminds me of the wooden houses in the Swedish city of Hjo. 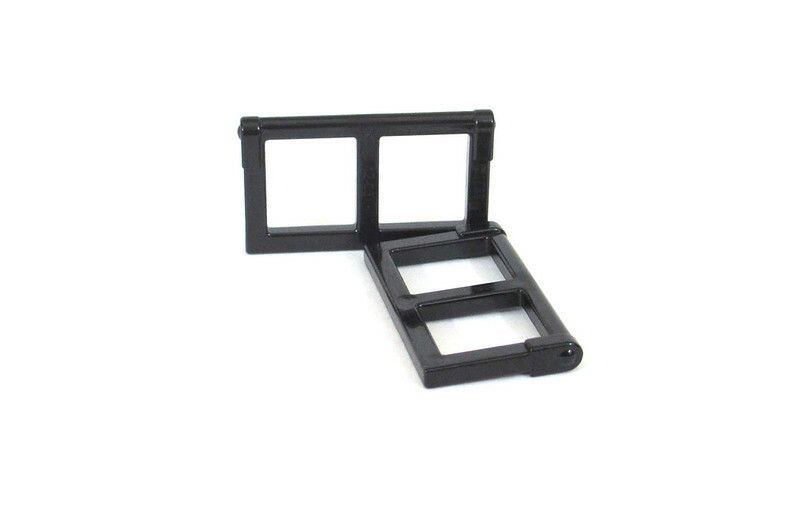 Great review, I will definitely pick this up, it is full of useful pieces... Especially sand green!